Bay Ship & Yacht one of America’s leading construction and refit yards for superyachts, recently expanded its capacity by unveiling a new covered dry dock. The new facility accommodates vessels displacing up to 6,300LT with a maximum beam of 76 feet. 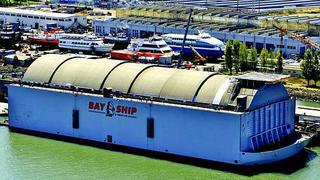 Currently the only dry dock on the West Coast to be fully enclosed by a retractable roof, this new high-tech facility on San Francisco Bay, California, is a conversion of the submersible Hughes Mining Barge (HMB-1), which played a fascinating role in a covert Cold War operation. According to CIA documents declassified in 2012, the HMB-1 was built in the 1970s by the U.S. Navy as part of Project Azorian, a top-secret plan to salvage the Soviet submarine K-129, which sank while reportedly carrying three nuclear-armed ballistic missiles. The ruggedly built HMB-1 was designed to submerge to 160 feet and sit on the seabed during the transfer of heavy equipment required to retrieve the sub. After Project Azorian’s successful conclusion, the HMB-1 was transferred to Lockheed Martin, where it became a floating dry dock for the Navy’s experimental 164-foot SWATH vessel Sea Shadow, a test bed for stealth technology. Today, the new HMB-1 dry dock, which has a 69-foot retractable roof, offers Bay Ship & Yacht clients a covered environment for superyacht service, repair and refit projects.